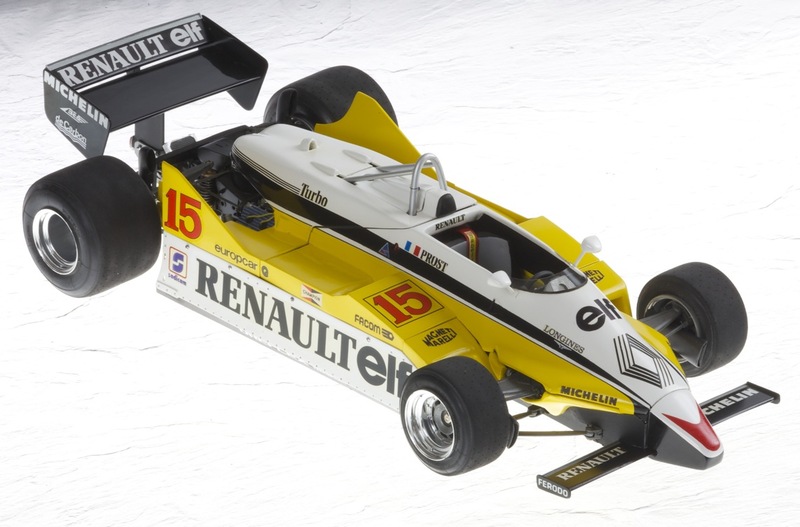 This car raced in 1982, with Alain Prost and Rene Arnoux being the exclusively French drivers in a French dream-team. Prost finished up closer to the head of the Drivers Championship at the end of the season, yet only scored two early season victories. Arnoux won two later races and only managed sixth in the title race to Prost’s fourth, mainly because of irritating unreliability of the car, often fuel system related. This was in spite of the frequent pole positions they shared roughly evenly, the cars certainly proving fast if nothing else. So, with the main competition (Ferrari) suffering double tragedy (Villeneuve dying at Zolder and Pironi’s career-ending crash in Germany) what could have been in a season where even the winning driver (Keke Rosberg) only won one Grand Prix, had Renault simply had reliability and enabled either driver to score more often. During 1982, the RE30B’s were a typical fixed-skirt car, the previous season’s hydro-pneumatic systems having been banned, so limited depth fixed sidepod skirts hugging the track surface were standard, optimising the aerodynamics of the venturi-shaped undertray. The downside was the rock hard suspension allowing absolutely minmal vertical movement and causing consequential exhausting spinal discomfort for the drivers. Moving into the flat bottomed RE40 for 1983, Alain Prost would feel he could have won the Drivers’ title if the team had managed their potential better and with resulting political discomfort Alain and France fell out of love for each other, such that he moved to McLaren for 1984. To read a detailed contemporary account of the 1/12 RE30B’s, please View the PDF as appeared in a relatively informal newsletter in 1998. Following a successful experience converting the Ferrari 312T into a 312B3, I built this model in 1997/8 as a result of studying the similarities and differences in the 1/12 scale RE20 and the 1/20 scale RE30B. Fully into the idea of converting one car model to another, I felt this change was possible and I was up for it. Therefore, I dismantled the rather tired, hand-painted RE20 and modified the monocoque initially, then also the engine installation and lastly applied a cutting disc to the bodywork, followed by some plasticard and Milliput. 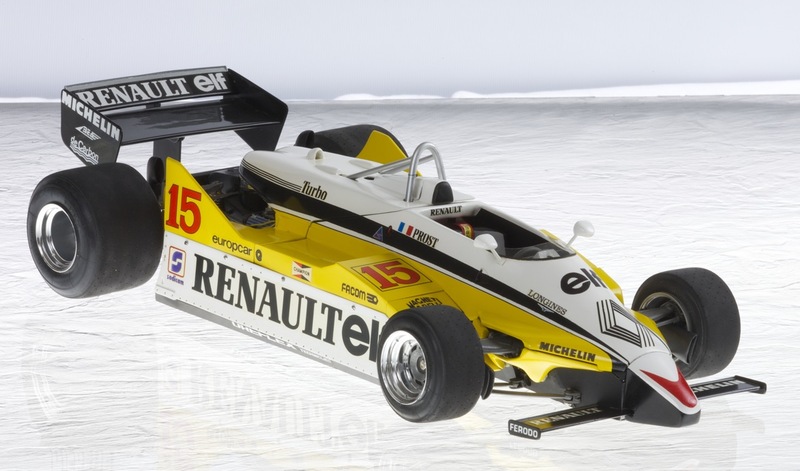 The result was a transformation into the RE30B (albeit with a Hewland FG400B gearbox, rather than a Renault unit). Richard H kindly produced some decals via a colour photocopier onto clear decal paper having enlarged the 1/20 sheet items (not recommended I’m told, as colour photocopiers operate at higher temperatures and you could be unlucky and cause an expensive problem). The end result captures the essence of 1982 which is not seen elsewhere in Tamiya’s offerings, namely the very forward driver’s seating position, the slender wings, the fixed skirt technology and the retention of a sculpted underbody. The model is somewhat heavier in terms of bodywork construction than my current projects and there is limited ability displayed around the cockpit area. However, overall a good result I am still proud of, another Prost car and a second Renault in the collection. I’ve admired your work since I read your Hesketh 308B build article in Scale Auto Modelling Magazine. I’ve only just discovered your website. Your 1/12 RE30B build intrigues me as I have a build planned in the opposite direction. 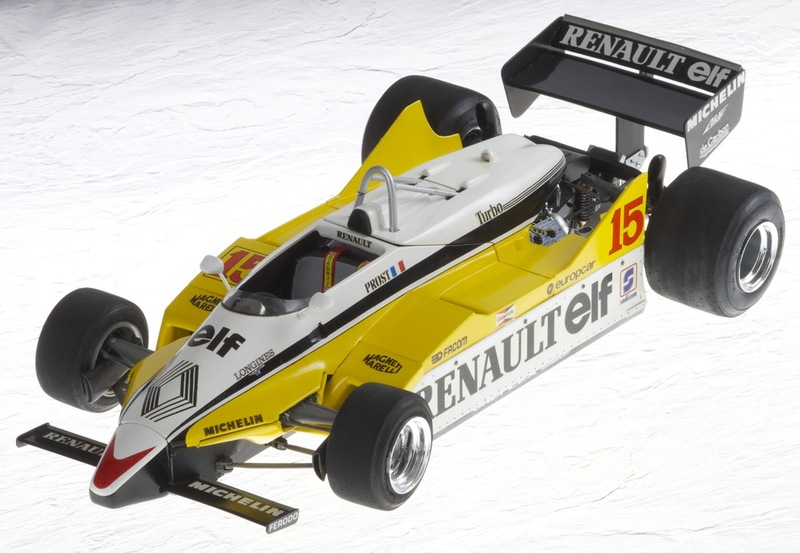 F1 cars of 1980 interest me particularly so I intend to use components of Tamiya’s 1/20 RE30B kit to produce an RE20 in 1/20 scale. Your techniques and use of materials has had a big influence of my approach to this build and others I am undertaking. Your Hesketh article inspired me to start on a full monocoque conversion of Tamiya’s FW07 kit to an 1980 FW07B which is still in progress.Please keep up the good work and most of all, its great to see you professing your Christianity in such positive terms.